The Des Moines Water Works Board voted Tuesday to proceed with a lawsuit against three northwest Iowa counties. Leaders of the utility claim officials in Buena Vista, Calhoun and Sac Counties have failed to adequately manage drainage districts in their area, causing nitrate levels in the water downstream to rise to record high levels. Governor Terry Branstad and Iowa Agriculture Secretary Bill Northey have criticized the utility, claiming voluntary efforts to reduce nitrate levels will improve water quality. Des Moines Water Works Board chairman Graham Gillette says he agrees there are “some beneficial things” in the so-called Nutrient Reduction Strategy (NRS). The problem is it doesn’t address our most current concerns — the fact that we’re running our denitrification units now in the middle of winter,” Gillette says. Bill Northey, the state’s agricultural secretary, spoke with Radio Iowa in January after Des Moines Water Works first raised the possibility of a lawsuit. Northey said there’s been “great progress” through volunteer efforts to reduce phosphorus runoff and soil erosion on the farm and the same approach will help limit nitrogen runoff. “We see some lakes that had phosphorus issues historically that don’t now, as they’ve worked on projects, and we’re just starting to engage on the nitrogen side the same way we have on phosphorus. So, I really believe that we’re going to be more successful,” Northey said. A member of the Iowa House who represents two of the counties named in the lawsuit said managers of the Des Moines Water Works have insulted “every family farmer in northwest Iowa.” Republican Gary Worthan is a farmer from Storm Lake. In January, he spoke on the House floor and talked of the blood he and his ancestors have shed while working the farm that’s been in his family since 1878. But, Gillette suggests the NRS places most of the burden on farmers to solve the problem of reducing nitrate pollution. “This lawsuit isn’t about us against farmers, it’s about figuring out how we can all work together better,” Gillette said. Bill Stowe, CEO and general manager of Des Moines Water Works, alleges the drainage districts in the three northwest Iowa counties are violating the federal Clean Water Act. The system to remove the nitrates costs $7,000 per day to operate, according to Stowe. Here is a joint statement of the following Iowa agriculture groups: Agribusiness Association of Iowa, Agriculture’s Clean Water Alliance, Iowa Agriculture Water Alliance, Iowa Cattlemen’s Association, Iowa Corn Growers Association, Iowa Farm Bureau Federation, Iowa Pork Producers Association, Iowa Poultry Association, Iowa Soybean Association, Iowa State Dairy Association and Iowa Turkey Federation. 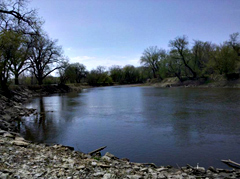 The announcement by Des Moines Water Works (DMWW) to pursue legal action against drainage districts in three Iowa counties reveals a startling disconnect from the scope and complexity of nonpoint water issues. It risks slowing the momentum of the nationally recognized Iowa Nutrient Reduction Strategy implemented with bipartisan legislative support in 2013. Nitrate levels in Iowa rivers are complex, fluctuating with weather and soil fertility but not significantly affected by fertilizer application rates or management. Our weather and nutrient-rich soils, which are ideal for growing plants, dominantly influence what happens in Iowa’s waters. Merely enacting regulation will do nothing to improve water quality. We will remain focused on empowering farmers and land owners to select and use scientifically proven practices that can have a real impact on water quality, which benefits all Iowans. Today’s decision undermines the strong relationship that once existed between Iowa’s largest water utility and farmers upstream. However, the DMWW litigation will not distract us from collaborative efforts that bring continual improvements in water quality.